If you have fair skin, you may suffer from rosacea. This condition affects both men and women, but is three times more common in women. Symptoms tend to appear after the age of thirty, including redness, blushing and acne-like blisters. Dermess Renewal offers relief for the embarrassment of rosacea. 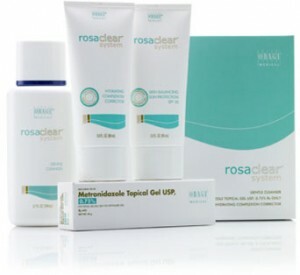 Rosaclear is the first and only complete therapeutic system developed specifically for treating the signs and symptoms of rosacea. The all-in-one system is designed to effectively reduce redness and flushing, along with treating papules and pustules (acne-like pimples), to help rosacea patients achieve a clearer, calmer and more balanced-looking complexion.